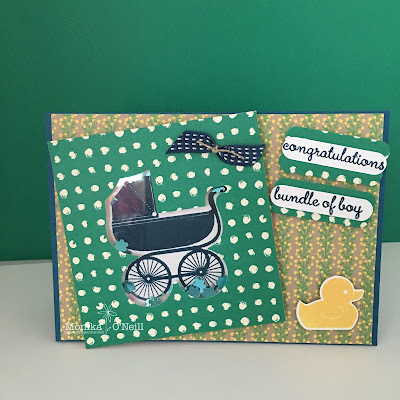 Hi everyone, for today's very cute Baby Boy shaker card I used the Something for Baby stamp set and matching die set, the new Dapper Denim card stock for the base of the card, the yellow and green background paper is from the DSP Affectionately Yours and the polka dot is from the Playful Palette DSP paper stack using the Bright Sequins for inside the shaker. I stamped the baby carriage in Dapper Denim and Duck in Daffodil Delight on Whisper White card stock, with the Big Shot I cut out the carriage using the die set, using the new foam strips for around the cut out carriage (a tip on using the foam strips around curves is to make little snips on one side this will make is so much easier going around) lastly using the clear window sheets. Unfortunately the blue ribbon and baby sentiments have both retired, but they can easily be replaced with the Dapper Denim Ruched ribbon and Made With Love stamp set sentiments. I have listed the products for you below for anything you need to make this card, just click on any of the products and it will take you to my store. Thanks for stopping by, I will see you here tomorrow.